to be among a crushing throng of thousands in front of St. Peter’s Basilica. upstate New York near the Canadian border. four, and Kateri died from smallpox in 1680 at the young age of 24.
saint has increased in recent years. since its military occupation in 1846.
servant type,” and a figure of reconciliation. after her death, she is the first “Native American” to finally be canonized. such a person freely accepts the gift. to make a living, but only secondarily. i.e. either married or single. authenticity only if it is freely chosen in response to God’s initiative. giving in marriage will no longer be. but is not bound to them by the virtue of religion. priest. Priests that you are familiar with are of the Latin Rite. of the West, but it does not see him in the same way as Catholics. remain faithful in living it out. and Anglican men who were married clergymen and later became Catholics. Keeping their wives, they were ultimately ordained as Catholic priests. study, he was ordained a priest at the age of 29.
was became a hallmark of his ministry. change civil law to make tithing illegal. priesthood, but he certainly did not have the charism of celibacy. were dedicated to La Purísima. is scheduled for publication in the near future. son the new parish priest in town. maternal grandparents were José Romero and María Trujillo. and devastated the denunciation of their beloved Cura de Taos. Presbyterian layman—prayed the main prayer of dedication for the event. God bless him and all of us! Mt. 19: 10-12, New American Bible. the good of the community. University Press Inc., New York. From the Latin saeculum that means world. Padre Martinez was in charge of la iglesia de Nuestra Señora de Guadalupe in Taos, New Mexico from 1826 until 1858. When he was first assigned there, it was an asistencia of the main parish church of San Geronimo located at the nearby Taos Pueblo. Guadalupe Church did not formally gain parish status until 1842. Nevertheless, it is one of the oldest churches dedicated to Mary under the title of Our Lady of Guadalupe that is continually functioning as a Catholic church (now for over two centuries) in the United States. The first Guadalupe Church in Taos was constructed around 1802 at the La Plaza de Don Fernando. It fell into serious disrepair, but was used until 1911 when it was replaced by another building in time for New Mexico statehood in early 1912. [My two older brothers–Airforce Major J. Tobias Romero (retired) and Rev. C. Gilbert Romero, Ph. D. were baptized at that venerable church.] That church was sadly destroyed by fire in the summer of 1961 a few months after joyful ordination of Father Gilbert, fifty years ago this past April 25.] A third church, phoenix-like, rose from its ashes within a year and located across the road from the original location. I have served as a priest at three different California parishes dedicated to Our Lady of Guadalupe: one in Santa Barbara, another in La Habra, and more recently in Palm Springs. Precisely one hundred years ago today, the leadership of the Agua Caliente Band of Cahuilla Indians in Palm Springs signed a document with twelve signatures thereby donating choice land to the Diocese of San Diego to be used for worship. The church built on that land is today’s Guadalupe Church in Palm Springs. Congratulations on the Centennial! According to the story of Guadalupe, Mary appeared to the Indian Juan Diego a few consecutive times towards the end of 1531. Very early in the morning of December 12, she appeared again and encouraged this unschooled and yet unbaptized catechumen and urged him to take her message to Bishop Zumaraga that a church in her honor be built on the spot upon which she was appearing. It was Tepeyac Hill in today’s Mexico City. The actual location was the site of the goddess Tonantzin, goddess of fertility sacred to the Aztecs. Only ten years after the noche triste of 1521 that inaugurated the Spanish conquest, Mary appeared in the center of the new world—the American continent– not as a Spaniard nor as an Indian, but as the mestiza (racially mixed) brown virgin. “Am I not your mother?” she assures Juan Diego, and then invited him to be her ambassador before the Bishop. Catholic faithful and others (Catholics who are not so “faithful” as well as many non-Catholics, including some non Christians) have a devotion to the mother of Jesus especially under the title of Guadalupe. To Spanish ears, that name sounded like a name already familiar to them. At the Monastery of Guadalupe in Extramadura, home to many of the conquistadores, there was a “black Virgin” widely venerated. However, the similar-sounding word in Nahuatl is translated as “she who crushes the head of the serpent”–understood as a reference to Genesis 3:15. This biblical citation is “The First Good News” or Protoevangelium. Immediately after the fall of Adam and Eve, God spoke to Satan in the form of the serpent and told him that the offspring of the woman (Eve) would crush the head of the serpent, but in the process, the “offspring” of the serpent would in turn wound the heel of the woman’s offspring’s. This text was the earliest foundation for messianic HOPE that prophets, speaking in the name of the Lord, helped to specify. Christian interpretation of that text understands “the woman’s offspring” first of all as the human race (Eve is “mother of all the living”), then as the Jewish people, and finally as Jesus Christ, son of David, son of Mary, Son of God. In the middle of the Basilica of Guadalupe, the imprint of Mary’s image on Juan Diego’s tilma is preserved and venerated as a holy icon. It is appropriately flanked by the the flags of every nation of the continent of America. Mexico City is the approximate geographical center of the continent of the new world. My confrere Father Virgil Elizondo likes to point out, “Just as Mary of Nazareth gave birth to Jesus Christ in Bethlehem, so also Mary of Nazareth–with her apparitions to Juan Diego– gave birth to Jesus Christ in the new world of America.” She is the primary evangelizer of America, the continent. In 1943, my family came to Los Angeles from Taos and Albuquerque, NM. Dad landed a wartime job as an accountant for Lockheed Aircraft in Burbank. The journey and our settlement was part of a long tradition of the New Mexican colonization of southern California whose culmination had taken place almost a century before. Antecedents of a pattern of migration to California—through Baja California– go back before the founding of the United States. [i] Between 1830 and 1842, over 150 families from New Mexico came and settled in southern California, making up the largest population center between Santa Fe and Los Angeles. Although the territory historically had a variety of names, the area was best known as Agua Mansa or San Salvador, clustering around today’s town of Colton on the border between San Bernardino and Riverside Counties. The inhabitants of these various small villages came to California from New Mexico through Abiquiu northwest of Santa Fe and southwest of Taos, and the majority settled in the area’s neighborhoods within a four-year span from 1838 to 1842. Of course, some of the New Mexican immigrants settled in the much larger town of Los Angeles, and others traveled into northern California and other environs. The leader or trail master of this trek from New Mexico to California in the fall of 1841 was Lorenzo Trujillo. His partners leading the group were fellow Abiqueños and mule-wrangler Hipolitano Espinosa, and Comandante José Antonio Martinez de La Rosa (de La Puente) was guide. Comandante Martinez was a single man, and would not become a settler as Trujillo and Espinosa were doing. It was the Comandante, however, who about four days after their arrival in California, would on November 9, 1842 make the contact with Mexican immigration authorities in Los Angeles to advise them the group from New Mexico had arrived. known as the Cura de Taos, Padre Martínez shared the same place of birth and most likely some personal interaction with these five who enjoyed a strong New Mexico-California Connection: Julian Chavez, Santiago Martínez, Comandante José Antonio Martínez, Lorenzo Trujillo, and Encarnación Martínez de Rowland. intersection of Interstate Highways 10 and 215. Santiago Martinez, although he had made other trips to the area probably since 1830, was the first of the group to settle nearby. Before reaching their destination, his wife gave birth to their son in 1838, and took up residence by the Santa Ana River that at one time may have been an Indian inhabitation. [iii] This northern New Mexico nuclear family thus became the first non-Indian inhabitants of what was to become known as the Inland Empire. Padre Martínez wrote a very significant Letter of Transit for John Rowland and family in 1842 when they emigrated from New Mexico to settle in California. John Rowland and William Workman—both having New Mexican wives and having become Catholics and naturalized citizens of the Mexican Republic—were eligible to own property and were among the first Anglos to become landowners in California. Although Padre Antonio José Martinez was never an inhabitant of California, with his Letter of Transit on behalf of John Rowland and his wife Encarnación Rowland de Martínez—likely a relative of the Padre–he nevertheless helped to fuel the development and even population explosion of the territory. Abiquiú today is a small village or group of villages along NM Hwy 84, southwest of Taos and northwest of Santa Fe-Santa Cruz (Española)/Chimayó and San Juan Pueblo. Throughout the nineteenth century, Abiquiú–a beehive activity–served as a major conduit, if not launching pad for travel between Santa Fe and Los Angeles. It was also the birthplace of a remarkable group of people who greatly influenced the life and growth of California in the two decades between1830 and 1850. It remains a spiritual vortex, a mystic space of great beauty that served as the jumping off point for many trekkers from New Mexico to California. In Jurassic times, Abiquiú was near Panama—slowly separated by the shift of tectonic plates at the rate of one thumb nail’s width a year. Remnants of prehistoric dinosaurs, common to both Panama and Abiquiú, were discovered in 1947 near Ghost Ranch, a Presbyterian Retreat Center located on Las Animas land grant. Over the centuries, Abiquiú has been a welcoming place for different kinds of people. Indians of every stripe and mixture made it their home. After internecine warfare and intermarriage, many had migrated from the four corners areas before the thirteenth century. Indian children captured in warfare among different tribes or with Spanish settlers sometimes grew up in Spanish homes as servants or slaves—a practice not considered controversial at the time–were baptized and brought up as Christian and known as Genízaros. Buffalo soldiers—black men fighting for the North in the Civil War—also have their honored place as residents in Abqiuiú’s history. New Mexico in general, but especially Abiquiú, is famous for its brujas/brujos whose transcendent and spiritual nature is conveyed by folk tales. They cohabit the stark yet supremely beautiful landscape with its hills and high cliffs shaded in textures of yellow, brown, orange, ochre, white and rust that nourish spiritual seekers such as Penitentes, monks (Catholic and Shiite), artists as well as reclusive movie stars. Its high desert lands are peppered with skeletal remains of cattle, often appearing in Georgia O’Keefe paintings. Angeles de Porciúncula, twelve miles west of the Mission and a short distance northeast of what is now central city Los Angeles. His residence was at a good location along El Río Porciúncula (the L.A. River), not far from today’s North Broadway bridge. A bronze memorial plaque at the entrance to Elysian Park, also a portal to Chavez Ravine, commemorates the Portolá expedition traveling in 1769 from newly founded Mission San Diego de Alcalá to Monterrey, the capital of Alta California. The Gaspár Portolá expedition on August 2 stopped at a cool resting place on a nearby hill overlooking the river. Fray Juan Crespín, Franciscan chaplain to the expedition noted in his diary the Franciscan feast day of Nuestra Señora Reina de Los Angeles, and named the river in her honor. The small chapel in Assissi and where St. Francis often prayed, met with his religious brothers, and had his “transitus,” i.e., where he died in 1226 was also dedicated to her. Three centuries later, the followers of St. Francis dwarfed the chapel by building a large basilica around it. The little chapel remained within the basilica, and became known as the “small portion” or “La Porciúcula.” Franciscans dedicated the chapel and basilica to Our Lady of the Angels, and celebrate its dedication on August 2. Mission San Gabriel, established in 1771, is one of the twenty-one Missions founded by Blessed Junípero Serra. Colonists from Sonora, a decade later in 1781, established a settlement twelve miles west of San Gabriel Mission, and named it for the river and called the new village El Pueblo de Nuestra Señora Reina de Los Angeles de Porciúcula, today more commonly known simply as L.A. On August 2 in the bicentennial year of 1976, Archbishop Cardinal Manning of Los Angeles placed a mosaic of the Annunciation—in honor of Queen of the Angels– over the portal of the Plaza Church that is mother church of Los Angeles. older brother of Julian Chavez, supported Perez in the failed attempt to impose taxes. Julian Chavez while in his twenties, traveled a few times between California and New Mexico. In 1837, he joined his older brother in the tax-collecting effort, and by 1838 definitively moved to California. In 1838, when he was thirty years old and only after eight years in California, Julian Chavez (1810-1879) became the Interim Mayor of Los Angeles. Chavez served three terms as a member of the County of Los Angeles Board of Supervisors in 1852, 1858, and 1861. His tract of land in Elysian Park (“Chavez Ravine”) was used as an isolation hospital to treat smallpox principally among Chinese and Mexicans. Besides becoming Vice Mayor of Los Angeles, Julian Chavez also served as Councilman specializing in water rights in 1846 and 1847. The year he became a member of the first group of LA County Board of Supervisors in June 1852, he hosted a July 4th party at downtown Bella Union Hotel. Afterwards, he invited everyone to walk with him in mile-long patriotic parade for a picnic at his vineyard off Riverside Dr. in the northeast part of the city (near today’s Stadium Way on the 5 Freeway). In1865, Julian was elected to the City Council, and soon afterwards, at the age of 55, got married to Maria Luisa Machado who was less than half his age. Bishop Mora presided at the wedding that took place at the Plaza Church of Our Lady Queen of Angels. Chavez served other terms as councilman in 1870-71, and again in 1873. He also served on the Plaza-Improvement Committee, and worked closely with William Henry Workman, the son of William Workman who had come with John Rowland from Taos to California in the early 1840s. Santiago Martinez and his pregnant wife Manuelita Renaga were in a caravan of seven people that Lorenzo Trujillo had led from Abiquiu. Manuelita “gave birth to a son (Apolinario) in late November at Resting Springs,[xii] an oasis in the high desert near the southern end of Death Valley”[xiii] and just over the California boarder from Nevada. Trjuillo’s small caravan arrived in the San Bernardino Valley on December 12, 1838– the feast of Our Lady of Guadalupe. The couple decided to settle on property near the present-day town of Colton. California rancher Antonio Lugo exchanged land for the promise of protection against Indians, and Santiago knew that through Lorenzo Trujillo, he could help recruit Indian fighters from Abiquiú to protect the Lugo San Bernardino Ranch. The young Santiago Martínez family lived on a “bluff overlooking the Santa Ana River near today’s San Bernardino Valley College campus.”[xiv] Santiago, his wife and child stayed there, but Lorenzo and the others returned to Abiquiú with the spring caravan. They came back to Rancho San Bernardino in the fall caravan of 1840—this time to settle where Santiago had settled. Hipolitano Espinosa and his family were among the first to settle there, and the settlement came to be called “Politana”[xv] in his honor. The California rendezvous location at Politana (an early settlement of New Mexicans, named for Hipólito Espinosa, at a draw near today’s San Bernardino Valley College) was an important place in the trading scheme of things. Hipólito Espinosa returned with his family to Rancho San Bernardino in the fall of 1840 and settled near Martínez’ place, thus beginning the New Mexican colonization in earnest. upriver to Santo Tomás that became the main church of Abiquiú. Lorenzo was a significant figure in the settlement of almost 150 families from Abiquiu who settled in the Agua Mansa-San Salvador area during the decade of 1840-1850. He married María Dolores Archuleta Martin, and they had seven children. His own family, as well as the Rowland-Workman party, was in the fall caravan of 1841 that Lorenzo Trujillo led from Abiquiú to Rancho San Bernardino. Traveler from Tennessee Benjamin Davis Wilson contracted Lorenzo’s four sons (Tedoro, Esquipulas, Doroteo, and Julian ) to herd a flock of sheep over the 1200-mile route. [xxviii] This was the principal food source for the party and for another group that joined up with them on the way to California. Trujillo’s daughter Matilde married a Sepulveda who owned land in the area of Pasadena and Altadena[xxix] where B.D. Wilson later resided and took up the timber industry. Mt Wilson is named for him, and he later became a governor of California. For all of Trujillo’s contributions to the area, including helping to organize regular Catholic Church services in the area, Lorenzo Trujillo is one of the Founder of Agua Mansa AKA San Salvador on the west side of Santa Ana River tributary. His homestead, Plaza Trujillo, is on the eastside of that same tributary where the Agua Mansa Cemetery is located, and a replica of the San Salvador church stands on the hillcrest. For our purposes, however, John Rowland—for whom Roland Heights is named—was the most interesting of the 1841 trek, and his wife Encarnación Martinez de Rowland was the most interesting of the1842 trek. Rowland.”[xxxi] Her parents were living in Ranchos de Taos where San Francisco Church is located,[xxxii] about seven miles south of the Taos Plaza where are located the Church of Our Lady of Guadalupe and the residence of Padre Martinez. form ill health. Ordained less than three years, Padre Martinez aided the aged and infirm Franciscan priest of San Geronimo with Masses and other sacramental functions at the asistencia of Nuestra Señora de Guadalupe in the Taos Plaza, not yet a separate parish. William Workman,[xxxiv] and their endeavors included fur trapping, general merchandise, timber and whiskey. citizenship. New Mexico Governor Armijo denounced them, and they decided to flee to California. In preparation for his 1841 trip to California, Rowland had asked U.S. Consul Manuel Alvarez living in Santa Fe for a letter of transit for his journey. Alvarez complied, and Rowland made the trip to California in 1841 with William Workman, but without his wife and family. Lorenzo Trujillo led the caravan with a variety of twenty-three Americans, but not family members of William Workman. The expedition left New Mexico in September 1841, and arrived at La Puente Rancho in California on November 5 of the same year. Upon arrival to California, Rowland and Workman traveled to the local political official in Los Angeles, and an official informed him that lands were to be obtained through the Governor of California with a recommendation of the Padre in whose area the lands were sought. I take the liberty of recommending to you Mr. John Rowland, native of the United States of America, naturalized citizen and resident of this jurisdiction [of New Mexico], since the year 1823. I have associated with him since the early years of his settling here, and I have known him very well as an industrious and peaceful man, respected in this country. The object of his journey to your district is, besides that of spreading the use of the goods of his country, that of seeking goods in yours; it presents–as is rumored–greater advantages so that he may transport himself and his numerous family to your district. I shall thank you for whatever favor you may deem worthy to extend to Mr. Rowland. If ever you will require my services in this country [New Mexico – a Deputación of the Republic of Mexico], you may be sure that I shall have the greatest pleasure in affording all that may make it pleasant for you. The letter of Avarez was useful, but had its limits. More was needed than political permissions and persuasions. John Rowland in the late fall of 1841 likely presented his own letter to Governor Alvarado requesting a tract of land in “a vacant place at La Puente.”[xxxvi], an area that was formerly a part of Mission of San Gabriel. After his long journey of two months, Roland finally got around to presenting his credential to Padre Tomás Estenaga of San Gabriel Mission. Padre Tomás Elenerio de Estenaga received Rowland courteously, but made no lands available to him or William Workman. The Mission owned large swaths of land in southern California, and had much to say about who might inhabit and come to own property in the area. The Catholic Church was still a very powerful institution in this northern frontier of the former Spanish Kingdom that was now the independent Republic of Mexico. Although Rowland’s letter was not addressed to him, the priest was opposed to what it proposed. of the Missions and holding the “line”, countered in a letter to John Rowland dated January 14, 1842. Padre Durán appealed to an 1835 law of the Mexican Supreme Congress, and formalized his objection in a letter to the Minister of the Interior and Public Instruction. The Presbyter, Don Antonio José Martínez, pastor of Taos, Department of New Mexico, hereby certifies, in the most ample form fixed by law, that Don Juan Rowland, a foreigner from the United States of North America, married to Doña María de la Encarnación Martinez, a Mexican, and naturalized in this Republic, and hence a Mexican Citizen like his wife, is a Catholic as is all his family. All of this is shown in the parish books of this parish of which I am in charge: that he is accustomed to partake of the Holy Sacrament, that he contributes to the support of the church, that he faithfully and religiously obeys the laws and enforces them when holding a position of authority. Yet with a degree of charity that day by day has been a greater credit to him, it is also known to me that in his social life he is held in the highest esteem as an honored citizen faithful to the state and to the Government, and respects the laws. He is quiet and pacific in all his acts, meeting the duties and responsibilities that are his. He complies with his promises and agreements in his attitude toward the church, and likewise strictly when dealing with others. He is well received by the inhabitants of this vicinity, and highly esteemed by the authorities. He has never been accused or even suspected of violating the laws for the reason that he never gave cause. In short, therefore, he has always been a man of fine deportment, his qualities being as set forth. This letter of transit from Padre Martinez helped John Rowland and his family not only settle into their new homeland of California, but also to prosper. The compatriots of Encarnación Martínez de Rowland who were living in Politana-Agua Mansa-San Salvador also continued to prosper. In 1843, in exchange for protection from marauders, Californian-Mexican Ranchero Don Antonio María Lugo gave 2,200 acres of his land to the New Mexican settlers who had a reputation of being experienced Indian fighters. The 1843 settlers occupied the location just south of Colton on the northwest side of the Santa Ana River. a small plaza with an enramada (brush-covered altar) in the center. rancho) at a community called Agua Mansa. nineteenth century. The arrival of Juan Ignacio Martínez–Encarnación’s brother and John Rowland’s brother-in-law–at Los Angeles in December 1847 was a token of the continued development of that connection. striking it rich in northern California–but to no avail. Padre Martinez with his letter of transit on behalf of Rowland was definitely instrumental in the land development of southern California. Both John Rowland and William Workman took possession of the land, and built their homes not far from each other. William Workman built his family home in what is now the City of Industry on Julian Road (Hispanicized William) off Hacienda Blvd. John Rowland in set up his ranch near what became Rowland Heights. [xlv] The La Puente Rancho that Roland and Workman divided between themselves has been further sub-divided into a myriad of independent southern California communities from Monrovia to Whittier. The New Mexico colonization had peaked. Enlisted as an instrument of manifest destiny during the U.S.-Mexican War, the Mormon Battalion was born. Brigham Young wanted to colonize the Pacific Coast, and favored purchase of the Chino Rancho. Emigrants left Salt Lake for California on March 14, 1851, and arrived at Cajon pass on June 11.In 1851, almost on cue at the very middle of the nineteenth century, Mormons came into San Bernardino as a new wave of immigrants, an brought their own style and heritage. $77,550. [xlvi] The purchase included 75 head of cattle for food and eight leagues of land where they would grow wheat on land where formerly sheep and cattle grazed. In their common attempt to avoid a spurt of Indian depredations, Mormons and Agua Mansa settlers lived together for a brief time during 1852 in the High Lands of San Bernardino. By 1853, the Mormons themselves had scattered, and a new immigration era had begun. of his New Mexican wife. Encarnación was buried in the private cemetery at the Workman hacienda off Hacienda Blvd. near Hacienda Heights in the City of Industry that is adjacent to La Puente. The small cemetery chapel is a mausoleum that is the finally resting place for so many women from Taos, New Mexico. An era had come to a close, and—with the second marriage of John Rowland to Charlotte Gray–a new era began. Antecedents of that pattern of migration from Baja California or New Mexico to California go back before the founding of the United States. In 1765, a Ute Indian sold an ingot of silver to a blacksmith in Abiquiú, the small village northeast of Santa Fe that was to play such an important part in the New Mexico-California connection. This led Juan Maria Antonio Rivera to take some Spaniards to explore western Colorado that at the time was part of New Mexico, but they soon returned to Santa Fe without discovery of the precious metal. Governor Tomás Velez de Cacpuchín instructed Rivera to return and explore the region once again—this time not for precious metal, but to reconnoiter the area for the possible presence of other Europeans. He found none, and again returned home after leaving a large inscribed cross near what became Moab, Utah. Angels. Fray Juan Crespi of the Portolá expedition made an entry into his diary on August 2, 1769, and called the river Río Porciúncula in honor of that Franciscan feast. twelve years before the City of Los Angeles was founded in 1781 as an asistencia of the San Gabriel Mission. This mother mission of Los Angeles, founded in 1771 two years after San Diego Mission, was the fourth in the chain of twenty-one missions of Alta California, most of them by the sainted Junípero Serra. to find out if any other Europeans were there. They began a journey toward the Pacific on July 4, 1776, but a Comanche attack gave them second thoughts. Just as Friars Dominguez and Escalante were about to scuttle their plan to transverse an overland route to Monterey in Alta California, they learned of Fray Garces’ successful trek. This spurred them on, and–with the full support of Governor Mendinuet– they recruited help from El Paso, southern Colrado and Utah. With further help of Genízaro guides from Abiquiú and the Indian boy Joaquin from Laguna, they again took up their expedition from New Mexico to California. become the first white men to explore the magnificent Arizona canyon. Republic of Mexico–freely flowed between St. Louis and Santa Fe. Trails are customarily initiated by prehistoric animals and then traversed by ancient hunters and gatherers. They are later tamed by people interested in trade routes for missionary and/or military use as well as for commercial purposes. Colorado River. Besides opening up commerce, the route would also open up the possibilities for evangelization. Emperor Iturbide’s Minister of Relations through Governor Sola requested Captain Jose Romero to invent a mail route between the points, and to take a party of sixty to map it by way of the lower Colorado River. Romero began the tasks in September 1822, and continued until 1826. Jedediah Smith, a tall mountain man over six feet, trekker and author of Commerce of the Prairies, traversed the southwest. In his travels, he connected many regions including Taos and Mission San Gabriel where, by his own testimony, the Padres twice receive him well, in 1826 and again in 1827. He died young at the age of 32 after an altercation, it is said, with Comanche Indians. Ana River, and Father Garces celebrated the first Mass on the first day of spring. Exactly two years after his first encounter with the region. De Anza again came through San Bernardino—this time coming from the north. In 1842, Governor José Figueroa secularized the missions, and in that same year, a contingent from Abiquiu, New Mexico settled along the Santa Ana River near present day Colton. Bernardino College near the City of Colton and the intersection of Interstates 10 and 210. [iv] Rowland, Donald E., John Rowland and William Workman: Southern California Pioneers of 1841, Historical Society of Southern California, 200 E. Ave. 43, L. A. 90031. [(323) 222-0546; Don (& Jean) Rowland – Camarillo, CA 93010 (805) 482-8129, p. 20.
introduced the couple to each other. (Trujillo), and the bill of sale was sent from La Puente, CA to Ranchos de Taos. [vii ] Juan Chavez may have been of altar server age, and so Miguel Gallegos also living in Abiquiu at the time, and who later went to the Padre’s elementary school in Taos, then to his minor seminary, studied in Durango and was ordained a priest. After an altercation with the American occupation, Gallegos served as New Mexico’s first congressman. [viii] His brother Lt. José María Chavez went continued with trips between New Mexico and California. Lt. José María Chavez went to jail the following year for his part in the Battle of San Buenaventura, California. After serving a short prison sentence, José returned to New Mexico to continue trading within the Ute territory into the 1850s. Genealogical Society of Hispanic America, pp. 144, 147. [xii] Lorenzo Trujillo had originally named this place Archuleta Springs in honor of his own wife Dolores Archuleta. 1842-1893, Diocese of San Bernardino Archives, 1998, pp. 111, p. 12. Bunker Hill by the Santa Ana River at the juncture of Interstates 215 and 15. The property included what is today the Greek Orthodox of St. Elias the Prophet. called San Bernardino. Historian George W. Beattie finds that plausible, but Bruce Harley–historian and former archivist for the Diocese of San Bernardino–vigorously disputed it. [xvi] Cf. Harley, opera omnia, passim. the Santa Ana River. It is just behind (to the south of) a very visible landmark: the lone cement hill called Stover Mountain, named for Isaac Stover, a Taos trapper who came to Los Angeles in 1837 and later settled in the Agua Mansa area. Since Word War I until recent years, Stover Mountain has been capped with an easily seen American flag. A bear killed Stover at an advanced age in the mountains of San Bernardino. [xviii] Rowland, op. cit., p. 74. Underscore – my emphasis. [(909) 594-1434] was well disposed to find out if the painting of the Martinez Adobe was still around. 1977, p. 120, total pp. 130.
south of Colton is named. The Agua Mansa-San Salvador settlement is just behind that landmark. [xxi] Carter Vickery, op. cit., Re: “La Rosa”- pp.116 (Spanish) and118 (English). [xxii] The original Spanish settlement of Abiquiú was established1739-1740. [xxv] David Weber, On the Edge of the Empire: The Taos Hacienda of los Martínez, Museum of New Mexico Press, Santa Fe, c. 1996, pp. 120, p. 44. Weber cites as his source A. B. Tomas, “Documents…Northern Frontier, 1818-1819,” in New Mexico Historical Review for April 1929: pp. 152, 158 and 159. [xxvi] José Antonio Martínez, the name as the Comandante of Agua Mansa, was also the name of the maternal grandfather of my maternal grandfather Ricardo Garcia whom we called Tito. I have no proof that the namesakes were the same person or even related. My grandfather Tito was born in 1881 at Arroyo Hondo, twelve miles north of Taos, and that makes it possible the two were contemporaries. Uncles of Padre Martinez settled Arroyo Hondo in 1804 by about the same time that Severino Martínez, the Padre’s father, was establishing his homestead in Taos. The timing works out so that he could have been either one or the other José Antonio Martínez, or both–the Colorado adventurer of 1819, or the experienced comandante who helped settle Agua Mansa, but never resided there. ¡Sabrá Dios! Martinez connection through my mother’s side of the family. San Bernardino County Museum Association QUARTERLY, Vol. 31 (1), Winter 1991, p. 19. [xxviii] Harley, CHRONOLOGY, op. cit., p. 145. 1841. Only William Workman and another brought their families on this trip. John Rowland would return to NM the following year to bring back his family. Benjamin Davis Wilson of Tennessee was a fur trapper in NM who in 1841 settled in Agua Mansa and married into the Californio Yorba family. Wilson purchased half of his land from Bandini, and then moved to Pasadena, and later became Mayor of Los Angeles in 1851. Mt. Wilson was named after him. Isaac Givens was an engineer who kept a journal of the trek (at UC Berkeley), and made a map of the La Puente land that was a cattle station for the San Gabriel Mission. It later became the Roland-Workman land grant, stretching east to west from the City of Industry and Hacienda Heights to Roland Heights-Walnut. [xxxi] Rowland, op.cit., p. 74. [xxxii] Rowland, op. cit., p. 27 refers to a bill of sale dated April 25, 1834 for six white horses that took place at La Puente, California—a championship horse-cattle ranch and grounds for San Gabriel Mission. Ignacio Martinez bought the horses from José Sepulveda for Encanación Martinez and for Rafael Martinez, and addressed the bill of sale in care of Encarnación’s mother Ana María Trujillo at Ranchos. Catholic faith (religion). One league is equivalent to 4,438 acres. Pueblo Indians, and descendants of the Spanish settlers of the area. Donald E. Rowland, op cit., pp. 61-62.
of La Puente, pp. 13-14. James M. Sheridan, Attorney and Counselor at law made first translation into English. [xli] Cf. Harley, opera citata, passim. [xlii] Spanish Trail Assocition, op. cit. Land Commission allowed the claim to stand. The U.S. Supreme Court ratified that decision, giving patent rights to the Rancho La Puente on April 19, 1857. [xlv] Address of original John Rowland homestead: 18800 E. Railroad – Roland Heights, CA 91748. In the second century, St. Polycarp, grand-disciple of St. John the Evangelist, wrote with sadness to the people of Philippi that St. Paul had evangelized and to whom he had written a beautiful letter. The sadness was about a priest, and his wife, who had “hung up his collar” before there was such a thing as clerical dress. It seems that dishonesty, unchastity, avarice and greed were the public sins of this former presbyter, and it seems that he walked away from ministry as opposed to being asked to leave. The following sentence is instructive and an example for us on how to treat “fallen” or wayward priests. We are still connected to each other in and through the Body of Christ, even if one or another goes astray—even a priest! They are not to be cast out, but invited back so that all of us can be saved. Powerful ecclesiology and soteriology, fancy words for the study of the Church and of Salvation! After such a long hiatus, I write this post on October 4, the feast of St. Francis who is patron of the Archdiocese of Santa Fe. Last week I was in Taos for a meeting with Vicente Martínez and Robert Torrez, former state historian of New Mexico. We are collaborating on a publication-project about the life and legacy of Padre Martinez, Cura de Taos. It was my joy to remain in Taos for a week, and concelebrate the 6 AM Mass at San Geronimo Pueblo on occasion of their patron feast of St. Jerome, September 30. This non-judgmental attitude, regarding the morality or sinfulness of priests who have not lived up to their spiritual commitments or promises, applies as well to Padre Antonio José Martínez in regard to his public conflict with his bishop, Jean Baptiste Lamy, or in regard to any alleged moral failings. Vicente Martinez of Taos, part-time resident of Florida, has done significant research in recent years on the progeny of Padre Martinez. It will be part of the documentation on the Padre’s Last Will and Testament that will accompany an annotated 1877 Biography by Santiago Valdez of Padre Martinez, and an 1840 Autobiography. I have had the privilege on assisting in the research and writing of this coming publication to which Father Tom Steele, SJ has contributed so much scholarship. May he rest in peace! Mr. Robert Torrez is Father Steele’s “anointed” successor as editor of the publication-project that may be out within a year, perhaps by the end of the centennial of New Mexico’s statehood. The publication-project purports to deal with the life and accomplishments of Padre Antonio José Martínez, “warts and all” (Vicente Martinez) “within their context, but without excuses.” (Fr. Juan Romero) Stay tuned! Next year, 1912, New Mexico will celebrate its centennial as a state of the Union. In his book My Penitente Land, Fray Angelico Chavez called Padre Antonio José Martínez (1793-1867) New Mexico’s greatest son. 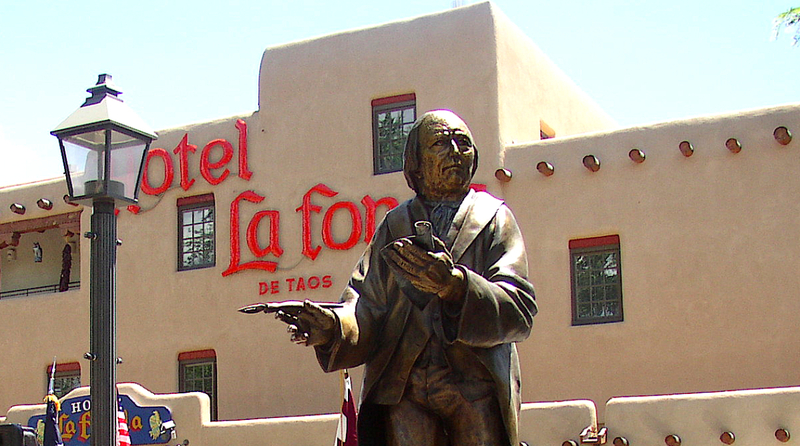 Upon his death, the NM Territorial Legislature called him “La Honra de Su País”/THE HONOR OF HIS HOMELAND.” In 2004, the NM state legislature unanimously reprised that encomium and provided funding for a more-than life sized bronze memorial in his honor that was placed in the center of the Town of Taos Plaza in 2006. His life traversed three distinct eras–the Spanish period until Mexican Independence from Spain in 1821, the Mexican period until the United States’ occupation of Santa Fe in 1846, and the American period until the present. His life of 74 years was replete with both great contributions to church and state as well as great controversies. He was a pioneer printer and journalist, author and publisher printing on his own press a newspaper, religious and political tracts as well as books. He was a priest of the people serving in his parish of Taos for forty-two years. He was an educator starting a school for girls as well as boys in 1826, a seminary in the 1833, and a law school in the 1846. He was an accomplished politician who served six terms in the Mexican legislature for the Mexican Republic’s Department (equivalent to a state) of New Mexico, and seven times as a representative for the Territorial Legislature of New Mexico after it became part of the United States. The last decade of his life was clouded by serious controversy with his French Bishop who came to New Mexico in 1851. The conflict dealt with the policy of tithing that Martinez successfully opposed as a young priest–begetting a change in Mexican civil law–but that Bishop Lamy reinstated shortly after his arrival when church jurisdiction was transferred to the hierarchy in the United Sates. Martinez was wrongly suspected of being complicit an 1837 rebellion against the Mexican government because of taxation. Ten years later, he was falsely accused conspiring to assassinate the new American governor Charles Bent–for whom there was no love lost. It is true the Padre Martinez had a child before he became a priest, and had some illegitimate children afterwards. However, either he was very discrete about this or his bishop chose not to make that an issue. Nevertheless, Bishop Lamy censured Padre Martinez first with suspension from the exercise of his ministry and then by excommunication for publicly disagreeing with his bishop on the question of tithing. Authors Father Tom Steele, S.J. (RIP), Vicente Martinez, and Father Juan Romero have been collaborating on MARTINEZ OF TAOS to be published sometime in 1912. Paul Espinosa, the award winning film maker of Espinosa Productions, has been preparing a film documentary on the Padre that is expected to be completed about the same time. To keep up on on these events, and to read documents and essays pertaining to the life and times of Padre Martinez, subscribe gratis to <thetaosconnection.com>. the children of the Martínez extended family. choose MANUALITO DE PARROCOS or VITURAL BOOK, Manualito de Parrocos. minutes to load, depending on your internet connection. A year ago today, I literally fell into the river. It was a great day to do so–the feast of San Juan Bautista. All over Latin America, especially in such places as Puerto Rico with its capital named after the Saint, people celebrate the feast by contact with water. By going to the beach, river, swimming hole or bath tub/shower, they symbolically renew their baptisms. Jesuit Priest Louis Tempe came to visit me in Palm Springs. He wanted to interview me about the Tercer Encuentro Hispano Pastoral for which I was the national coordinator from 1984-1985. The consultative process sponsored by the American Bishops lasted for several years culminated in a summer event that took place at Catholic University in Washington, DC. It resulted in a national pastoral plan for Spanish speaking Catholics in this country, and has been implemented with various degrees of success. In any event, after the interview, I took him to tour the cool springs at Indian Canyon. The Agua Caliente Tribe of Cahuilla Indians for centuries have used their hot springs–where today is located the Spa Hotel in Palm Springs –in the winter. During the summers and during warm wather, they went to the cool springs in the canyon. During the guided tour I was giving, I got a little too close to the edge. It was an unintended occasion for the renewal of my own baptismal promises.